I just noticed the humans falling from the sky. That's mildly terrifying. 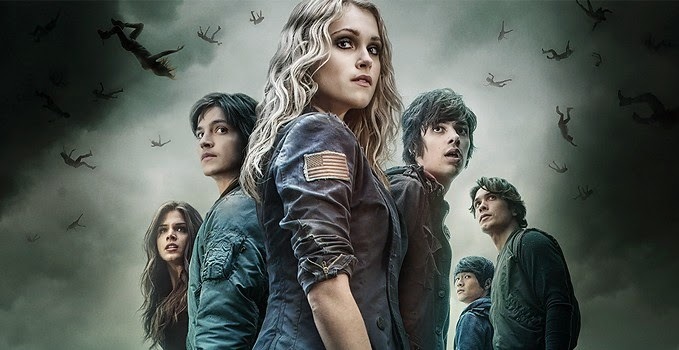 In case you aren't aware, The 100 (prounounced 'The Hundred') is a dystopian TV show about a post-apocalyptic earth. Basically, a nuclear strike wiped out the whole world. The only survivors were those who were on space stations at the time of the obliteration. Now, three generations later, the humans aboard the combined space station, nicknamed The Ark, need to return to the-possibly-radioactive earth, and they send a group of 100 teenager convicts to check it out. Adventures, pain, and crying ensue. Speaking of tears, let's talk about Jasper for a moment. JASPER, OKAY? I basically continued watching this show to make sure nothing happens to my baby. (It didn't. Yet.) Between his adorable little face and his goggles, I am in love. and the writers will probably break my heart. Monty, and Jasper's friendship with him, is a really great addition and gives me lots of feels. I really like Monty, and his pharmacist-family backstory is really cool. I wish I could know even more about him, but more on that later. Bellamy is not at all what I expected. He's kind of villainy thus far, but eventually he turns into an anti-hero, so I'm okay with that. I don't understand how such a deep voice comes out of such a cute face, though. He won my heart when he taught Charlotte how to face her fears. And then I got mad at him when she freaking killed a man. But I digress. Finn: At first, I hated Finn. Why? Because getting out of your seatbelts in a space shuttle hurtling towards earth is not exactly smart. I thought he'd be a stereotypical punk kid, and because of that, I thought we were supposed to hate him. But then it is revealed that he's actually a pretty nice guy. And I like him now. I loved Wells from the moment I met him. But as time goes on, it's pretty clear he's getting the short end of the stick. AND THEN HE DIES. I'm so freaked out by that episode, okay? At first I was like "OMG AW BELLAMY IS TEACHING CHARLOTTE HOW TO BE OKAY WITH HER FEARS. MAYBE HE'S NOT SUCH A VILLAIN AFTER ALL. THAT'S GREAT ADVICE!" I should've known what would happen, after Clarke and Wells finally work things out, only for him to DIE. Poor kid. Poor Chancellor. Poor Wells. Poor Clarke. Poor everyone. The representation is decent and better than I expected. We see many people of color in both supporting and speaking roles. The Ark looks like a space station would probably look, with a wide variety of people, instead of being completely whitewashed. The only problem is, while Monty and Wells have a lot of screentime, they're not getting a whole lot of deep development yet (spoiler; highlight to read: or they end up being assaulted and then KILLED, in Wells's case). While not everyone is getting developed--regardless of what race or gender they are--I still wish we could see Monty in a more prominent role. We'll see if this changes. As for female characters: so far Clarke, Octavia, and Raven are all falling into the "wow, I'm a badass female!" character trope. I can kind of be lenient with this because even the guys are getting rather cardboard roles so far. Still, I'm hoping this improves as the show goes on. Disclaimer: Now, that part was a little awesome because it led to an awesome BROTP between Jasper and Octavia (I really ship that.) And I don't think it's necessarily bad that Octavia took off her clothes, because it fits her personality. But it seemed as if Octavia was meant to be ogled at in that scene, which does annoy me. Speaking of taking off clothes, Bellamy also inexplicably appears shirtless in the second episode. (I'm not sure why I'm surprised, it is The CW.) It must run in the family. Not that I'm complaining, but guys--you are in an unknown environment with radiation and possibly mutated bugs, if the two-headed deer is any indication. Maybe it's wise to cover up? In episodes 2 and 3, Abby is convinced that the 100 (the kids, not the show) are still alive. My question is, how in the heck does Abby know that the kids aren't dying from radiation? I understand that her daughter is on the surface, so maybe she has a little false hope, but Abby, I had hoped you'd be more rational than this. Then, Raven comes along to inform them that hey! The kids are taking off their wristbands. And Abby and her accomplice are like "hey, seems legit." I can almost accept this one because yeah, Raven knows how kids think. But still. Some pretty faulty logic here. Which kind of does happen more than once. At one point in episode 2, Finn and Clarke just randomly get in a body of water, after Octavia was NEARLY EATEN BY A FREAKING SNAKE THING. Why would you do that?! They don't even check out the water for SNAKE THINGS. They just dive right in. Okay, dudes. While I really like the Chancellor, Thelonious is kind of a weird name. Catfighting. Octavia and Clarke immediately begin fighting over Bellamy. Of course. I didn't really like Atom (due to seeing the same actor on Heartland), but dude... kissing in a field of glowing butterflies? I kind of shipped that. I really liked the inclusion of Radioactive by Imagine Dragons at the beginning when the hundred kids land on earth. (And, I have to say, Octavia screaming, "we're back, b*tches!" was exciting.) It seemed like a realistic portrayal of what would happen if teens were sent to earth. Like, how could you not be excited to be on earth, after living your whole life in space? Finn looks like a younger Ben Barnes. See what I mean? In the beginning of every episode, Clarke says she was born in space and she's never breathed real air. Then what the heck are they breathing on the space station? Despite cheesy dialogue from adults and children alike, the heart of this show is solid. It has everything I like: woods, bonfires, apocalyptic teenagers trying to survive, and a futuristic spaceship! (It also has adorable boys. Yes, I'm talking about Jasper, okay?) This show is tailor-made for me, practically. The world-building is solid, with concepts that are actually thought through instead of just thrown in for the heck of it. Like yes, if space stations were floating above the earth, the life support would eventually run out. As cruel as it is, it does make sense from a heartless viewpoint to send down the criminals. And unfortunately, I don't find it too hard to picture a nuclear blast wiping out the earth. Sometimes the problem with dystopia is that the stories become too far-fetched, and it's hard to believe that would ever happen. Not with this show. Everything, so far, seems plausible to me. The characters aren't very developed, but in reality, are any characters really developed at the beginning of Season 1 of any show? In fact, for having almost one hundred kids to focus on, I think they're doing pretty well. The plots are engaging and they always end on a cliffhanger (hence why I got sucked in). The writers are not afraid to take the unthinkable route (LIKE KILLING CHARACTERS. Ugh.) And, even the villains are people you occasionally root for, and the good guys aren't good 100% of the time--in other words, there are lots of gray areas and nuances to the characters, which I love. Overall, it's an engaging show. So in spite of the cheesiness at some parts, the plot, the characters, and the entire concept is solid. I'm very much looking forward to watching the rest of this season, and then season 2. And speaking of season 2, Mirriam is very helpfully recapping episodes of that right now. Be sure to check those out (but beware of spoilers: [highlight to read] and be prepared to weep that a certain previously-lovable character has apparently turned into a psychotic man killer). And above all, watch The 100! It's truly an incredible idea for a show, and I'm really excited to see what happens next. Do they hurt Jasper again?!? Does Monty ever get more development? WHY DID [NAME REDACTED] HAVE TO DIE?! When does Bellamy become a semi-good guy? Why does a certain character go bad? And most importantly, what will happen next?